“Cool as a cucumber”, or so the saying goes. Well, just in case you were wondering what you are able to do in order to combat the sweltering heat whenever summer approaches (or if you already live in the tropics), then a refreshing cup of cucumber juice is definitely more than welcome – add in a dash of pineapple or lime, and you’ve got quite the winning combination there. 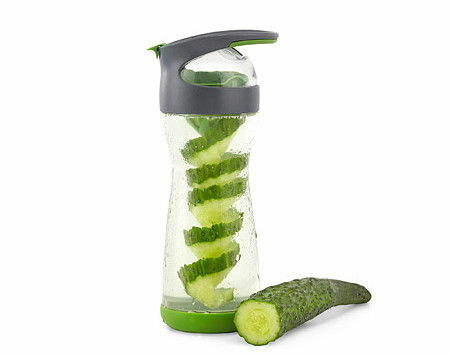 How about having a bit of cucumber goodness to go along with your regular drinking water bottle? This can be achieved thanks to the $19.99 Cucumber Infuser Water Bottle. The Cucumber Infuser Water Bottle is definitely handy enough to carry around with you, where it sports a really sturdy lid and is made from silicone and BPA-free plastic. Apart from that, it has another advantage, would be to have it feature a built-in slicer which will be able to add spiral-cut cucumber in a jiffy to your water sans knives or other kinds of specialized kitchen tools. In addition, studies shown that infused water would help encourage folks to remain more hydrated, but cucumbers have an added advantage by delivering a slew of antioxidants, vitamin K, and electrolytes, among others. All that you need to do is to twist the cucumber into the opening, in a pencil sharpener-style no less, and you’re good and ready to go.